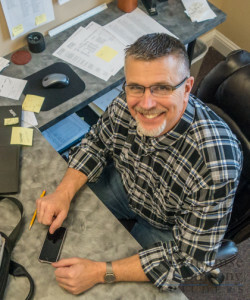 Mark Spicer | Abrahamse & Company Builders, Inc.
Mark Spicer has over twenty years of construction experience that ranges from running his own company that specialized in painting and home repairs to being the operations manager for a local excavation and site work contractor. Mark also worked for the County of Albemarle for ten years as a fire marshal. He still serves on the Board of Directors of the East Rivanna Volunteer Fire Company. With his experience in emergency services Mark is also the Company’s OSHA compliance and safety officer. Mark enjoys the logistic and organizational aspect of construction projects. He states “I have always been one to be organized and pay attention to detail”. He brings a calm and unflappable demeanor to his work and is a true gentleman. Mark is a Charlottesville native and is married to Carol, his wife of over 25 years. They have two children with college degrees who are working in the education field: one is the Assistant Dean of Students at Susquehanna University in Selinsgrove, PA and the other is a teacher in Raleigh, NC. Mark and Carol enjoy gardening at their home and spending time at their vacation home in Oak Island, NC.